This bubble ball is very suitable for All family gatherings, parties, and indoor/outdoor events, widely used for family, backyard, playing center, amusement park, water games,swimming pool and seashore scenic spot. 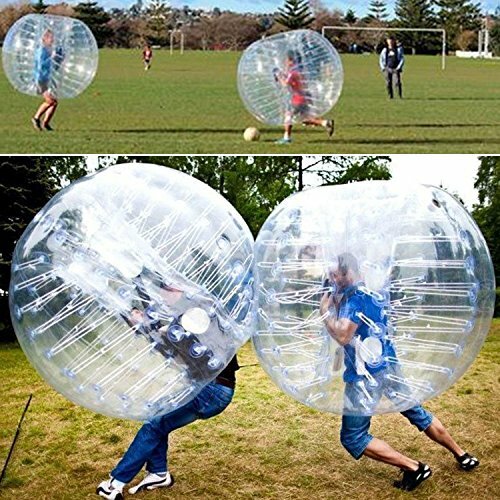 Playing soccer wearing the inflatable bumper ball now is very popular. Using Inflatable Bumper Ball, you can experience these unique fun Balls with families and friends come with your friends these are serious fun and will have you laughing just watching your friends fall over. [ ENJOY THE FREEDOM ] The Bubble Ball is perfect for indoor or outdoor activities. Enjoy the freedom when bouncing, flipping, rolling over and bumping, while you are playing games like Bubble Soccer, Bulrush and Last One Standing. Suitable for family gatherings, picnic, birthday parties, social sports gathering, barbecue, on the beach, in the park, or in own backyard.